Phila Massages is proud to count as part of its team the finest massage therapists of the area. All of our therapists are passionate and specialized in sports massage, and keep their licensure, education, certifications and insurances up to date. Now a Philadelphia local, Natacha is a French-Zambian who has lived in 6 countries on 3 continents. As both a licensed massage therapist and a french-licensed “masseur-kinésithérapeute” (physical therapy), she serves as the technical lead to our team of therapists and brings over 10 years of diverse global experience to her work. 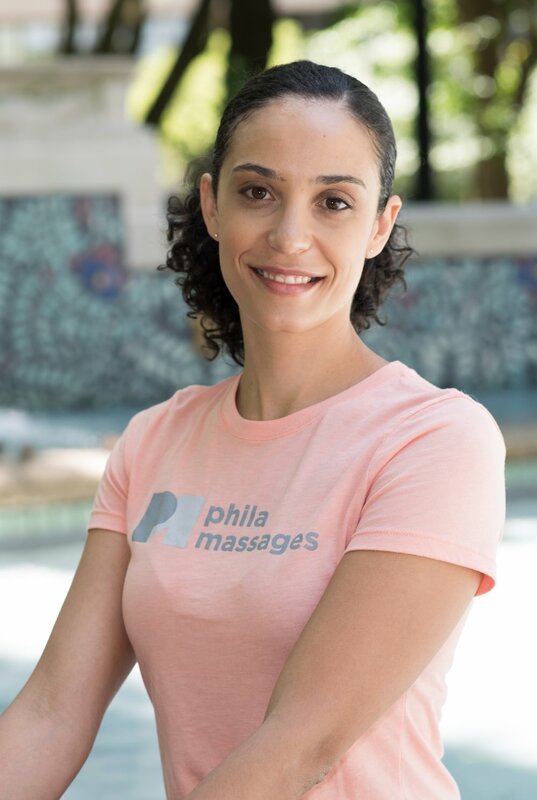 With her strong background in physical therapy and anatomy, Natacha is a massage therapist who is always looking to combine innovative and proven massage techniques to treat athletes as efficiently as possible. She will understand what is best suited for you, and will strongly deliver the massage you need! Originally from Sydney, Australia, Olivia Snyder has considered Philadelphia home since 2010. Olivia completed her Massage Therapy certification at Lourdes Institute of Wholistic Studies, where she studied a range of bodywork modalities, including Myofascial Release and Active Isolated Stretching. In addition to contributing her massage skills, Olivia works hard behind the scenes as the Marketing & Public Relations Director. She assists with Phila Massages events, produces marketing materials, and helps in the overall business plan for the company. She enjoys putting her caring personality and valuable skills to use professionally with Phila Massages clients. 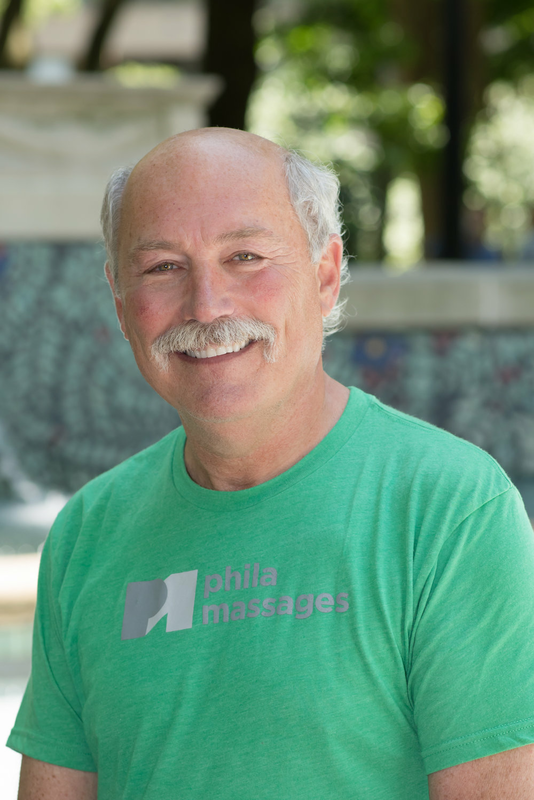 Originally from northeastern Pennsylvania, Martin comes to Philadelphia after spending several years in Ithaca, New York, where he studied a wide range of massage and bodywork techniques. He found his specialty in sports massage and rehab related modalities in order to compliment his own passion for running and other athletic training. Martin’s main intention for each session is to integrate stress management with pain reduction while creating space for each client to find awareness in their own bodies so that he or she can function at their most optimal level. A native New Yorker, Amanda studied Applied Science/Massage Therapy at Trocaire College in Buffalo NY. Having also lived in Florida and North Carolina, she has now called Philadelphia home for two years. Amanda brings more than seven years of medical massage knowledge with her, with previous experience in both Chiropractic and Physical Therapy practices. An athlete herself, Amanda enjoys running, playing volleyball, snowboarding and yoga. She also has a BS in Alternative Medicine, and believes that massage is a key component in the maintenance of a healthy body. Her ample experience in working with injured clients and athletes is a valuable contribution to the team! Dennis is a graduate of Rutgers University and Lourdes Institute of Wholistic Studies. Having worked for an extended time in the Court System, he has steered his interests to sports massage. As a runner himself, Dennis identifies with the runner/competitor/client who seeks a pro-active edge in maintaining their physical and mental well-being, and he believes that massage is a paramount modality to address this need. He currently performs a full schedule of post-race massage and stretching sessions at triathlons in the Philadelphia area and the South Jersey area, where he resides. Compassion, conscientiousness and communication are his keys to a fruitful session. Nick began his career as a massage therapist in 2009, when he graduated from National Massage Therapy Institute. After graduation, he continued his journey with NMTI, teaching the Massage Therapy program. In his five years as an instructor, he studied many different types of massage techniques, including myofascial release, sports massage, and active isolated stretching. Nick is an avid weightlifter, with experience competing in several different types of events. He is currently working on competing in a bodybuilding show and also plans on training for his first triathlon in the near future. His understanding of kinesiology and his experience as an athlete have helped shape him into a knowledgable and skilled sports massage therapist. Born and raised in the greater Philadelphia area, Dillon studied massage therapy at Cortiva Institute of Massage Therapy. Coming from a background in fine arts with concentrations of study in figure drawing motion and animation, he has always had an interest in the human form, and the way it works. Naturally, he decided to pursue a career in massage therapy and found that the therapeutic aspects of sports massage were where he would like to specialize. In his free time Dillon enjoys time in the gym and outdoors. Born and raised in Vineland, NJ, Joey was introduced to the field of bodywork by his sister, a massage therapist herself. Inspired by the amazing results that her massage techniques could produce, he went to study at the Cortiva institute of KOP to get his massage education and license. A runner and basketball player himself, it was only natural for him to then specialize in sports massage therapy. He enjoys practicing a variety of techniques, including Myofascial Release and Active Isolated Stretching, and appreciates how they are a part of a training and recovery program that makes an athlete improve their performance. An avid learner, he is continuisly studying new techniques and increasing his knowledge of sports massage. His passion translates into therapeutic goal orientated massage sessions that get results! Breandan graduated from La Salle with a nutrition degree while running for their Division 1 Track and XC program. For the past seven years, he has worked with athletes at Philadelphia Runner providing gait analysis and shoe fittings, while completing 5 consecutive Philadelphia marathons, 2 Boston marathons, one half ironman and 2 Ultra marathons (100k and 50k). After suffering multiple stress fractures, he decided to pursue Sports Massage Therapy and graduated from the Philadelphia School of Massage and Bodywork in center city in 2017. Breandan's accomplished running background allows him to relate to clients experiencing injury or suffering from general aches and pains, and to evaluate and help with proper biomechanics and muscle balance. Colleen Woytas graduated from the Massage Arts Center of Philadelphia in 2011 and has been practicing massage therapy in Philadelphia for the past 8 years. During that time, she has worked with a wide range of clientele and developed a passion for treating people that were recovering from injuries, suffering from chronic pain, and athletes on all competition levels from amateur to professional which led to her concentration in Sports Massage, Deep Tissue Massage and accompanying therapies. Colleen has also worked with athletes during peak season, pre-event maintenance and post-event recovery. She is an avid supporter of massage therapy and it’s benefits and will continue her education to grow as a therapist in the field. During a session, Colleen aims to provide treatment but also educate the client on what effective techniques are being used to treat the issue as well as preventative self-care. Courtney is a Philly native with ten years of experience as a Massage Therapist.Courtney believes in the body’s ability to heal itself and utilizes her expertise to assist in this process. Her style combines clinically based deep tissue, myofascial techniques, and stretching to calm, reset, and relax the body.Courtney believes that the fusion of movements is beneficial in addressing the needs of clients suffering from chronic pain, those experiencing the stresses of a demanding life, and athletes of all kinds.